SEOUL (Reuters) - Samsung Electronics Co Ltd said on Wednesday its new Galaxy flagship smartphones were selling well in China and it was confident it could reverse the recent slump in its fortunes in the world's biggest smartphone market. Samsung's market share has plunged from about 20 percent in 2013 to less than 1 percent currently as fast-growing Chinese rivals such as Huawei Technologies Co Ltd proved more agile in responding to the latest trends. "It has been tough in China in the last two years. 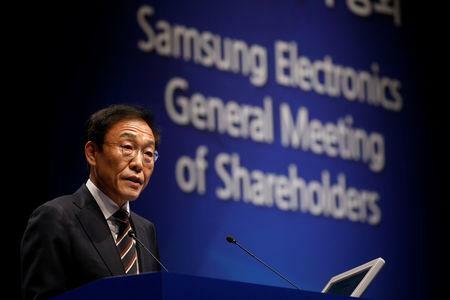 We have changed everything from our organisation and people to distribution channels," Samsung Electronics Co-Chief Executive DJ Koh told shareholders at the firm's annual general meeting. "I think our flagship and mid-price models, these two products will bring a lot of change to the China market ... I am positive." While Samsung remains the world's largest smartphone maker with nearly a fifth of global unit sales, it underperformed a slumping market last year and has closed one of its mobile phone manufacturing plants in China. The South Korean tech giant is pinning its hopes for a fight-back on its latest handset featuring a big, bending screen and the first 5G connection in a premium phone, a feature analysts do not expect Apple Inc to match until 2020. The upbeat outlook for mobile devices in China contrasts with the company's more pessimistic take on 2019, with trade tensions, weak economic growth and softer demand for memory chips expected to weigh on operations. 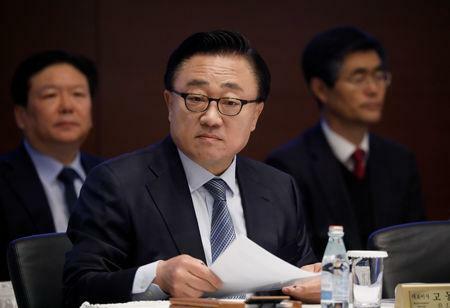 "We are expecting many difficulties this year such as slowing growth in major economies and risks over global trade conflicts," Co-Chief Executive Kim Ki-nam told the meeting. Some shareholders vented their frustration and took the microphone to berate executives. "If you're paid a lot of annual pay, you should work harder. I'm asking the management to do good work," one shareholder told the board. The meeting drew more than double the usual crowd following a stock split last year which made it easier for retail investors to own Samsung stock. 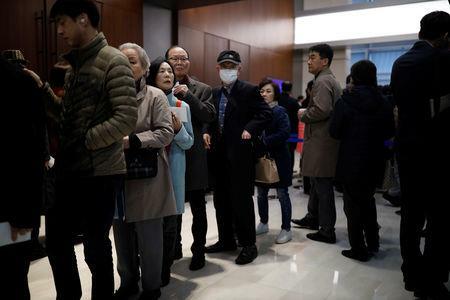 There was a long queue around the Samsung building to get in, and some shareholders complained they were getting hungry as the meeting dragged on. As expected, shareholders voted to approve the appointment of board directors.